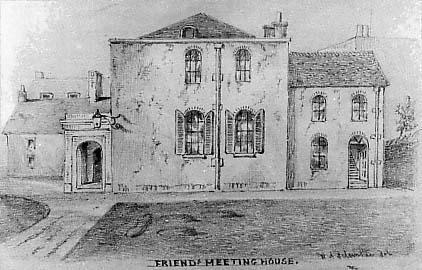 The Quaker Meeting House, Ship Street, Brighton. The first Meeting House had been an old Malt House in New Road dating back to 1716. 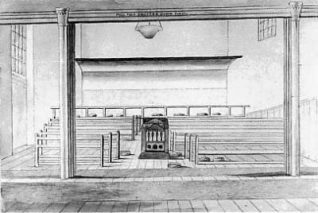 Inside the Meeting House. The shutter in the picture was pulled down to make a special meeting room for children. The Meeting House was heated by a coke stove in the centre of the room. The high windows were to stop any distraction from silent worship. Quaker Meeting House, 1875. Taken previous to alterations in 1875. The first Quaker meetings in Brighton were attacked in a way typical of the rest of the country. The independence of Friends was seen as a threat. In 1658 Anglicans coming from church ‘fell to breaking the windows of Will Gould’s house and one woman with her bible broke much thereof and then flung filth upon the people and in their face …and then they hauled Joseph Fuce out of the towne threatening to cast him in ye sea if they came againe and thrust and stoned others along the streets’. As a result of this persecution Quakers met at West Blatchington and Rottingdean until 1700. In that year worship began in a converted malt house sited at what is now the southeast corner of New Road. By 1700 there were many dissenters in Brighton. In that year 25% of live births were to Presbyterians, the largest group, or Quakers. The number of dissenters in Brighton had not gone unnoticed by the authorities. The S.P.C.K. had been founded to address dissent through education – children were taught to read the catechism – and opened the first public school for boys in Brighton in 1702. By one of those strange twists of history the trustees appointed John Grover, a practising Quaker, as schoolmaster. Half the boys in the town attended the school and John Grover remained the schoolmaster until he died in 1750. He became a notable figure and helped many with such legal documents as wills and deeds. 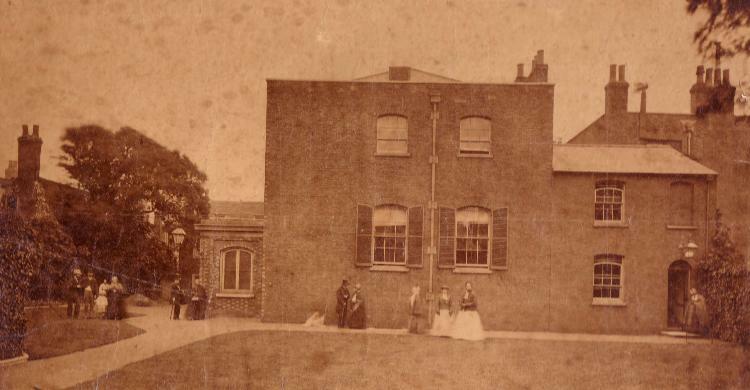 Local Quakers moved to the present site in 1806 when the Prince Regent wanted to extend his garden and close the road that ran past the entrance to the Pavilion. The land, a burial ground, was sold and New Road constructed. 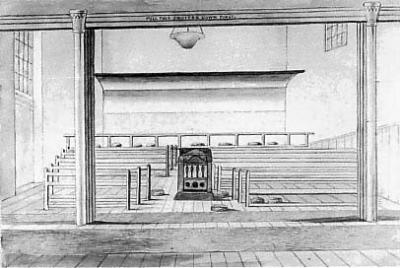 The current meeting house was built on a plot owned by a Quaker butcher called John Glayzier. Only the meeting room and cottage were built. The entrance was by the side door with a path leading round through what is now the lecture room and canteen to ‘Meeting House Lane’. This lane already existed and led to the Presbyterian meeting house, now the Font and Firkin public house. The current front entrance was a plain wall with two small windows. Windows were placed high in the walls to stop any distraction from silent prayer. There was another path to Ship Street. Prince Albert Street had not been built and the view from the current porch was of the back of a row of cottages on Ship Street. What we now refer to as the garden was a burial ground for 54 adults and 34 children. Quakers were buried in their own land in unmarked graves. The whole site was originally part of the grounds of St. Bartholomew’s Monastery. Legend has it that the forebears of the fig trees in the garden were in the monastery orchard. This is given some credibility by the fact that another fig tree survives nearby in Black Lion Lane. The meeting house was heated by a centrally placed coke stove. The vent for this can still be seen in the middle of the room looking like a decorative feature. Brighton Meeting grew with the town in the 19th Century. In 1851 the census of attendance reveals a membership very similar in size to the present one. In 1875 an adult school was added to the north of the building and the current entrance constructed. The adult school was the forerunner of the Friends Centre and adult education classes have been held continuously in this building since 1876. The Friends Centre was founded by Quakers in 1945 and grew out of the recreational activities run for Canadian troops in the Second World War. It is still supported by Quakers and is only one of a handful of independent centres in the country. The adult school taught writing – most could read – bible studies, temperance, literature and socialism. The classes for 1892 include ‘class extinction, Christian socialism and Christian secularism. A ‘sick and coal club’, savings bank, book club, library, mothers’ meeting and free breakfasts were all provided. The participants organised themselves and founded groups such as ‘The Federation of Working Men’. Brighton was the base for the London, Brighton and South Coast Railway and even steam engines were built here. Most of the participants in the adult school were railway families. By the end of the century there were ‘missions’, licensed meetings houses, at Black Rock (1859) and 41 Trafalgar Street (1891). Black Rock meeting house was sold in 1958 and the site sold when the Marina was built. Trafalgar Street was sold in 1945. Pacifism is a central practise of Quakers. In our own meeting the current Peace and Social Witness group was begun in 1934 as the Peace Committee and one of our members, Alan Staley, was a co-founder of CND. 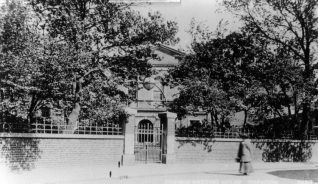 How have Quakers dealt with the fact that Brighton has always been a major garrison town? The answer is an interesting one. In both world wars local Quakers supported the young soldiers as fellow human beings. They provided social activities, including help and materials for writing home, as an alternative to pubs and gaming. Commanding officers would not have allowed the soldiers to attend had pacifism been openly promoted by local Quakers. The ghost of a nun, Brighton’s most famous spectre, is said to walk down Meeting House Lane and through the bricked-up arch to the left of the back door. She is said to have been bricked up here in medieval times. The archway was actually filled in sometime after 1844. It was the original entrance into the grounds. Revisionists argue that the nun is actually a Quaker as dressing in grey was customary until into the twentieth century. The meeting house has become known as a quiet place in the heart of Brighton, though the liveliness of the area has presented, and continues to present, challenges. In 1883 a minute records that meeting for worship was disrupted by noise from the Brittania Beer House in Ship Street. The meeting house is not only used by the Quakers and the Friends Centre, it is also a venue for many marginal, alternative and non-violent social and radical groups and causes a ‘den of nonconformity’ in the heart of Brighton. Isaac Bass was a wealthy grocer in Brighton and lived at 15 Prince Albert Street,adjoining the Friends Centre. Does anyone know any more about him – he married Sarah Glaiyser. Does anyone have any information about the Hack family, Sussex Quaker bankers? They came from Chichester but some settled in Brighton. I am descended from Priscilla Hack who married Samuel Tuke of York, thus giving rise to the surname Hack Tuke. The Tukes were pioneers of psychiatric reform. There are numerous letters written by members of the Tuke and Hack family, in the West Sussex Records Office. See also my account on John Barton in “Chichester History” Nos 17 and 18 (the Journal of the Chichester Local History Society). Barton’s sister, Maria, married Stephen Hack in 1800. Does Mr Locke have any family papers? I was trying to find out something about the Hack family when I found this site. Does anyone know if the Hack family had a connection to Pembrokeshire? I found a number of books that had belonged to various members of the Hack family with Brighton bookseller’s marks when I was clearing a neglected shed in the back of a deceased relative’s house in Newport, Pembs a couple of years ago. The most likely explanation is that these were sold as a lot to a bookseller and then were acquired by one of the local wealthy families (suggested by the signatures in some of the other books I found), before somehow ending up in the rather humble place I cleared out. The inscriptions are interesting: “Poems” by William Cowper printer J Johnson 1798 signed “Priscilla Hack 1798” and several other volumes of Cowper. “Pilgrims Progress” (Bunyan, of course) Strahan and Company Limited 1880 signed “Daniel P Hack from his loving daughters P.F & M.P.H New Year’s Day 1881” and perhaps the most interesting is the unsigned “Hack’s English Stories” by Maria Hack. Harvey & Darton 1825. Any information appreciated. Martin: Maria Hack is the sister of John Barton the economist – she was published by Darton & Harvey and her daughter Margaret married Thomas Darton. She had 10 children, two of whom emigrated to Australia and I don’t doubt a branch ended up in Pembrokeshire. Priscilla Hack was probably her mother-in-law Priscilla Hallyer. Possibly the Pembroke Hacks derive from her son Thomas Sanden Hack who was an architect in Bristol. Ann Griffiths – Is it possible for me to get hold of a copy of your article on John Barton? Martin – Apologies for spelling error; for Hallyer read Hayllar, daughter of Daniel Hayllar. In response to Edgar, James Hack (who co-founded the Chichester bank in 1809 with William Hack and Charles Dendy) and wife Priscilla Hayllar appear to have had at least 11 children (I’ve not seen the parish original records), with one daughter Priscilla marrying Samuel Tuke (1784-1857), the psychiatry pioneer. Their children include Daniel Hack Tuke (psychiatrist) and James Hack Tuke (philanthropist for Ireland). I have a large family tree of the Tuke family – most descended from William Tuke III, a Yorkshire Quaker who pioneered the humane treatment of the mentally ill at The Retreat in York. Daniel Hack Tuke’s son was Henry Scott Tuke, RA. There is a short book called The Tukes of York, by William and Margaret Sessions, which gives more information on this family. I worked out the Hack books connection to Newport Pembs shortly after I posted last August. I cannot find all of the links at the moment, but the information is available on the net if one cares to search. Talking to my father-in-law: he was invited to help himself to the books when he was a boy in the 1950s by a Mrs Francis Crawley nee Scarr, originally from county Wexford (obit: http://archive.thisispembrokeshire.net/2006/3/9/9205.html) He recalls boxes of books in an old leaky barn of which he randomly took a few with nice covers/prints. The rest were then burned. The Scarr family seems to be the connection. Several of the books in the collection are inscribed EJ Scarr. One copy of Cowper’s poems, originally inscribed “Daniel Pryor Hack 1819” is subsequently inscribed “EJ Scarr Christmas 1914 from Philip Hack” Presumably the books came over to Wales from Ireland with Francis Crawley. I think I worked out the connection between the two families last year though frustratingly I cannot recall it now (and haven’t the time to look again) Might have been psychiatry. As I was born and grew up in Brighton until the age of 23 in 1974, I have found reading about Brighton’s non conformist history very interesting and revealing. My family have no connection with Quakers (for whom, as a non believer, I have a great deal of respect) but my Great Grandfather was John Popham who founded the Strict Baptists Galeed Chapel at the top of Gloucester Road in the middle of the 19th century.